It’s almost over but National Heritage Week runs until Sunday and there are still loads of great things you can do in the coming days. 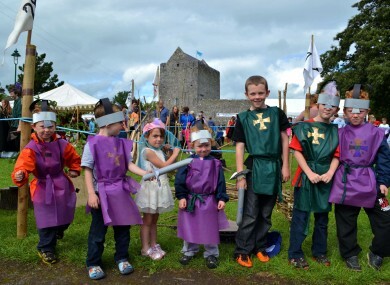 Children taking part in the Walled Towns Day in Athenry, Galway earlier this week. AS YOU MAY know, this week is National Heritage Week with over 1,700 events taking place across the country. Hundreds of events have already taken place and hundreds more are scheduled to take place over the coming weekend, the majority of which are free. The Heritage Council is now advising people interested in getting involved to contact event organisers to check availability for events coming up this weekend. Heritage Week runs until this Sunday and you can find out what’s happening in your area –at heritageweek.ie or the Heritage Council’s two free apps on Android and iPhone. What: An opportunity to view the conservation work of Irish Landmark. Self-guided tour of this restored C19th light keeper’s house, now available for holidays. Child supervision required due to coastal location. Where: Loop Head Lightkeeper’s House, Kilbaha, Co. Clare. When: Sunday 25th August 20:00 – 22:00 (FREE). What: Situated at the foot of Baelic Mountain, in the heart of North Cork, Laharn Cross is the location where people gather each and every Sunday night throughout the summer months to enjoy open air cross roads dancing. Large crowds step it out on the raised timber platform and dance the night away to live music. Waltzes, quicksteps, foxtrots, not to mention polkas, Shoe the Donkey and the Siege of Ennis, are the order of the evening. Where: Laharn Cross, Laharn, Lombardstown, Mallow (Signposted from the N72 Mallow-Killarney road). What: Denis O’Sullivan will put his Hurling and Camogie collection on display – including radio recordings, DVD footage and rare images. Don’t miss this chance to meet Denis, chat and see this fabulous collection. Where: Bishopstown Library, Wilton, Cork. When: Sunday 25th August 16:30 – 17:30 (FREE). What: Adrian Gebruers presents a special recital on the 49-bell carillon of St Colman’s Cathedral in Cobh. Cobh carillon is the only such instrument in this country and is the largest in Ireland and Britain. The carillon is played from a console within the belfry. A closed-circuit system is in operation showing the carillonneur playing. Where: Cobh Carillon, St Colman’s Cathedral, Cobh. What: Competition of Spear-Thrower, approved by the World Atlatl Association Inc. The contestants will use archaeological replicas of throwers and darts. Also the event will provide a replica of a Mesolithic camp, with areas for children and a cooking area, based in Irish archaeology. Where: An Bun Beag Beach, Tidal sandbanks of Magheraclogher beach. What: Visitors will be guided through the rooms of this Victorian Hall, home of the headquarters of Irish Freemasonry since 1869. Booking is essential as places are limited. Where: Freemasons’ Hall, 17 Molesworth Street. What: Walking tour, Donal Fallon (Historical Insights/Come here to me!). This tour will explore tenements and housing in Dublin city historically, looking at issues such as the Church Street disaster of 1913. Starts at Collins Barracks and ends in O’Connell St (adjacent to LUAS). Where: National Museum of Ireland , Decorative Arts and History, Benburb Street, Dublin 7.
Who: National Museum of Ireland/Historical Insights/History Ireland, Eimir O’Brien, bookings@museum.ie, 01 6486453. What: The event starts at Loughshinny Harbour at 3pm with a talk on Harry Hawker’s connection with Loughshinny, the unveiling of a commemorative plaque and annual blessing of boats and then continues at St. Brendan’s N.S. at 4pm for a photographic display on the plane crash and life of Harry Hawker and the presentation of prizes for winning school projects. Where: Loughshinny Harbour and St. Brendan’s N.S., Loughshinny, Skerries. What: Workshop with Maureen Culleton for children aged 8 – 12 years on traditional Irish sean nós and brush dancing. Where: Dunamaise Arts Centre, Portlaoise. Who: Laois Heritage Office, Maureen Culleton, timpeallanti@eircom.net, 087 6482038. What: Learn about clothes from the past and the societies that wore them, from Elizabethan nobility to Medieval serfs! Where: The Hunt Museum, The Custom House, Rutland St. Limerick. What: A boat trip to visit some of the islands in Lough Ree. Booking essential. Where: Lough Ree. Organiser : Irish Wildlife Trust, Longford Westmeath Branch. Who: Noreen McLoughlin, iwtlongfordwestmeath@gmail.com , 087 4127248, Please email iwtlongfordwestmeath@gmail.com for bookings. What: Learn about Irish Lacemaking (Carrickmacross) with demonstrations by Elsie Moxham. Held in partnership with the Longford Federation of the Irish Countrywomens Association. Booking recommended. Where: Longford Library, Town Centre, Longford. Who: Longford Library, Heritage & Archives Services, Mairead Ni Chonghaile, heritage@longfordcoco.ie, 043 3340731. What: Medieval brewing demonstration. Swing by to sample some traditional ales and meads and learn about how they were brewed in medieval times. Where: Old Mellifont Abbey, Tullyallen. When: Sunday 25th 15:00 – 17:00. What: The annual Feis Teamhra celebrates Tara with music and poetry from Kevin Barry, Eavan Boland, Iarla Ó Lionáird, Susan McKeown and Paul Muldoon. Where: Hill of Tara Visitors Centre, Tara. What: The team from ‘The Donkey Sanctuary’; ‘Sathya Sai’, Sligo and ‘The Mayo Donkey Sanctuary’, Kiltimagh are back! Come along, meet the donkeys and watch hoof trimming and feeding demonstrations. Lots to do and see for all of the family. No booking required. Where: National Museum of Ireland – Country Life, Turlough Park House, Turlough, Castlebar. When: Sunday 25th 16:00 – 23:00. What: At the American Wake in Dolly’s Cottage we will recreate the scene with traditional music, song, dance and storytelling around the turf fire. Cost: Donation. What: Learn about one of Ireland’s most fascinating crafts by joining us for a thatching demonstration on the lawn. Free access to the house by guided tour only. Where: Swiss Cottage, Ardfinnan Road, Cahir. Who: OPW, Eleanor Morrissey, eleanor.morrissey@opw.ie, 052 7441011. Email “17 great things you can still do during National Heritage Week”. Feedback on “17 great things you can still do during National Heritage Week”.